We’ve danced to the eclectic sounds to the Belgian Gypsy fusion band Mec Yek (“Once Again”) and tapped our feet to the rhythms of Gypsy jazz talent Fapy Lafertin , we’ve interviewed key figures associated with the 14th World Roma Festival “Khamoro,Da” and have become fast friends on an adventure that promises to be an experience that will shape and change us forever. We are the inaugural group of the University of Pittsburgh’s new study abroad program – “Roma/Gypsy Music, Culture, and Human Rights in the Czech Republic, Poland, and Slovakia” (May 26-June 12, 2012), a group of 12 students, a research assistant and led by Pitt ethnomusicology professor Dr. Adriana Helbig. 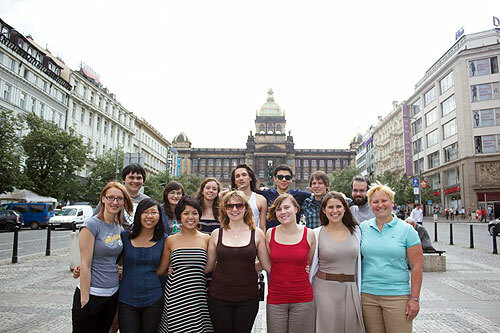 We are joined by five students from Charles University and Dr. Zuzana Jurkova, an ethnomusicologist who has helped organize this program with Dr. Adriana Helbig through the University of Pittsburgh’s Center for Russian and East European Studies, Study Abroad Office, Department of Music and outside provider CET based in Washington, D.C. Please check back to our blog as we update our experiences at the Khamoro Festival and prepare for our travels to Poland (June 3-7), where we will visit Krakow, Auschwitz, and the Tarnow Museum of Romani Culture, then continue on to eastern Slovakia (June 8-12) to conduct research in rural and urban Roma settlements near Kosice. Among the program’s many goals are to draw awareness to the role of music and culture in the Roma rights movement and to teach students the fundamentals of fieldwork. Students attend lectures by internationally recognized music scholars, human rights activists, politicians, and Roma public figures. Evening concerts feature Roma traditional and popular music, Gypsy jazz performed by famous Roma musicians of today. The University of Pittsburgh’s Roma/Gypsy music, culture, and human rights program, in collaboration with Charles University in Prague, is officially recognized by the “Khamoro” World Roma Festival and the United States Holocaust Memorial Museum in Washington, D.C. Thanks for the update! Looking forward to hearing about all your adventures! Hope you continue to have a fabulous experience!! Wow! Sounds like an incredible experience for you and your students!! What could be more exciting than having the opportunity to listen to great Gypsy jazz and learn about the culture and people who create it , firsthand! !